This seminar explores the personality as an interactive system constellated around the “Self” with its creative potential. You will become acquainted with your own inner dynamics and peace potential by allowing the qualities of the HeartSelf-Intelligence to unfold thorough various exercises. Thus a deep acceptance and change in attitude towards oneself and others emerges. Change begins within and by looking through the eyes of the heart. This, in turn, creates a different vibration of the energetic field within and surrounding us. The heart and brain can then align with each other. The seminar is based on The HeartSelf-Intelligence® method, a transpersonal psychological approach. We invite you to join our morning yoga lessons and evening heart meditation. Permaculture Gardening Basics; offered with daily yoga and meditation included. 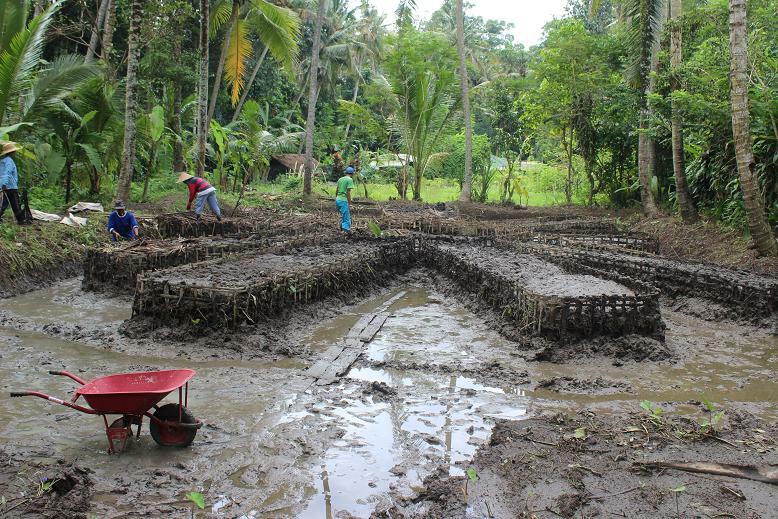 Chinampas, the first in Bali, are 100% self-resourced biomaterial structures, realized by our enthusiastic volunteers from all corners of the earth. It’s been a very challenging project, to look at the muddy tangle of weeds that was the swamp and see a flourishing garden, but such is the creative nature of the permaculturist, who believes that every problem is also a solution. The swamp–part pond, part oversized mud puddle—was in its untouched state home to a thicket of water plants and tangled, vine-like weeds. The structure of a Chinampa begins with a rectangular frame, woven from flexible strips of bamboo and staked into the mud. The first layer of the chinampas is a bed of dry, brown material—fallen coconut palm leaves primarily. Next comes green material; we used the weeds, grass, and plants harvested from clearing the swamp. Next is a layer of the rich, clay-based mud from the swamp, which forms the third and final layer. When the layers are complete, we will plant the garden on the elevated platform and trees along the perimeter. As the roots grow they will secure the structure of the chinampas, supplanting the bamboo frames, which eventually will rot away. Chinampas, or “floating gardens,” are a subsistence agricultural technique designed by the Aztecs, originally constructed along the shallow lakebeds in the Valley of Mexico, as a resourceful way of turning stagnant wetlands into thriving agricultural gardens. This project is the brainchild of volunteer Stephanie Garvin, and has been executed by our international volunteers, Kris (Sweden), Hannah (Germany), Egle (Lithuania), Mika (Germany), Celsae (USA), Gloria (USA), Marina (Slovakia), and Luz (Argentina). We appreciate their hard work and commitment! 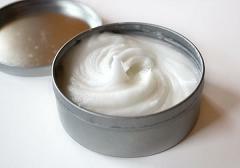 Luckily, you don´t have to rely on commercial deodorants and risk as serious damage to your health. There’s an amazingly effective deodorant that uses just a few natural ingredients and can easily be made in your own home. The main ingredient in this natural alternative is our virgin coconut oil, organically certified and made with love here at Jiwa Damai. This deodorant has a pleasurable scent, moisturizes the skin, and those who use it swear by it. 1. Combine equal portions of baking soda & arrowroot powder/cornstarch. 2. Slowly add coconut oil and work it in with a spoon or hand blender until it forms a firm but pliable texture. It should be about the same texture as commercial deodorant, solid but able to be applied easily. If it too wet, add more arrowroot powder/cornstarch to thicken. 3. You can either scoop the mixture into your old deodorant dispenser or place in a small container with an airtight lid and apply by hand. Baking soda absorbs odors, cornstarch absorbs wetness and coconut oil is an anti-oxidant and a moisturizer with anti-fungal/anti-bacterial properties. You can also add essential oils such as tea tree oil for its antibacterial, anti-fungal and antiseptic qualities. We offer individual internships to national and international students and post graduates in various fields. We would like to invite passionate individuals to Jiwa Damai to develop their projects and to put theory into practice right here on our grounds. The Lagu Damai Foundation, based in Bali, Indonesia, provides educational growth opportunities for local youths and adults. The foundation conceives and develops socially responsible projects based upon the core values of unfolding the HeartSelf–Intelligence, consciousness of joy, and personal empowerment leading to increased self-esteem and self reliance, all the while working in co-operation with the environment, community, earth, and humanity as a whole. Nineteen year-old Jordi has been working at our center for several months. You can find him working in our garden in the early morning hours, after which he rushes off to Denpasar city to attend Ngurah Ray University, where he studies social politics. Jordi is one of ten children from a very poor family. Because he is alone here—his family resides on Sumba Island—he sometimes is very homesick and he dreams about meeting with his family soon. 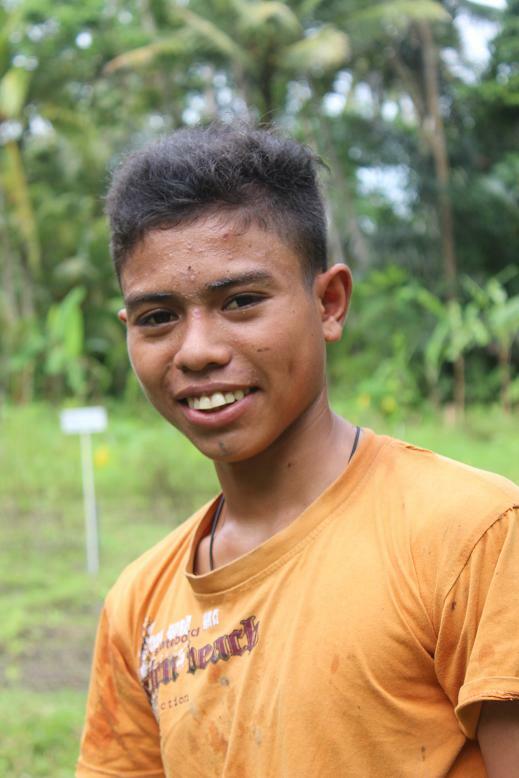 He would like to become a politician to return to the Sumba region and help people. 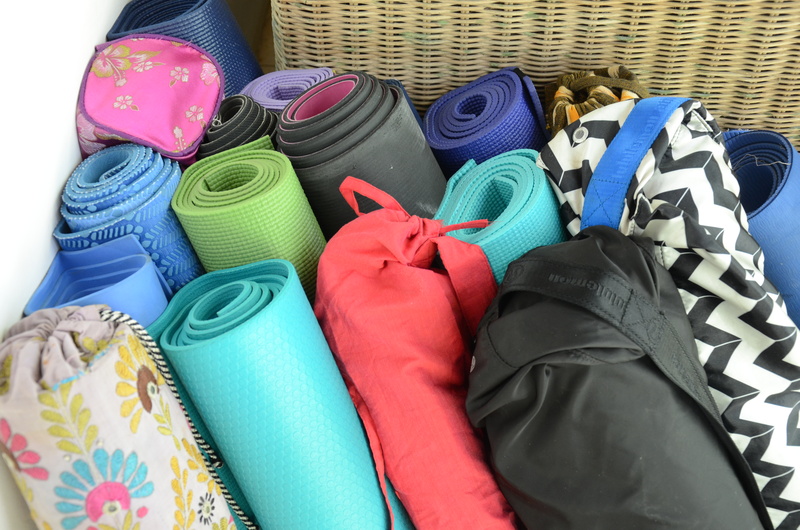 We hosted a 24 day yoga training retreat at Jiwa Damai organized by School Yoga Insitute, it was a most interesting and intense experience. About 30 young people training day after day, getting up at 6 am to Meditate, then doing their Yoga postures, getting lectures about anatomy and sutras and much more. Our kitchen was working high speed, providing the vegetarian cuisine and many smoothies and of course, fresh coconut juice. It was a pleasure to see so many young people learning and exploring themselves through this training. They will be back next year and are very much welcome. Have you heard about the miracle tree? The tree that can provide your body with a multitude of vitamins and is great for improving your overall health? 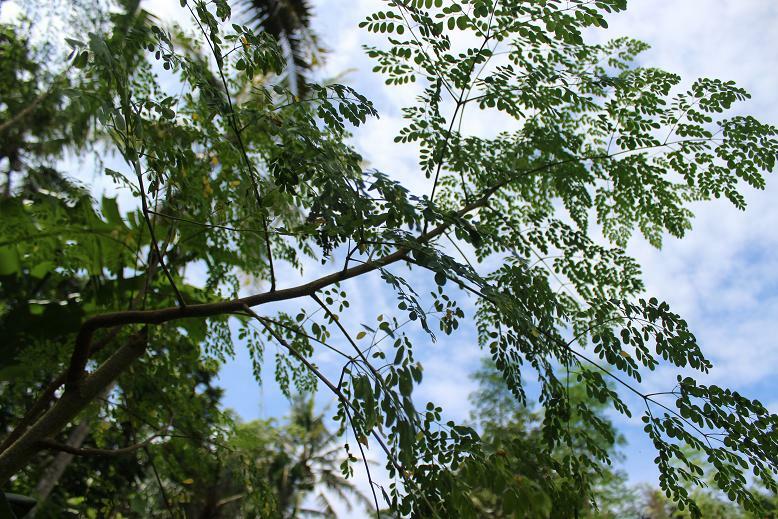 The name of this super tree is the Moringa, and quite a few of them are growing in the gardens at Jiwa Damai. The moringa is a fast-growing, drought-resistant tree native to the southern foothills of the Himalayas in northwestern India, but widely cultivated in tropical and sub-tropical areas. With its potent health benefits, it’s quite miraculous that moringa trees grow in subtropical areas, where malnutrition is most prevalent. This tree is one of the world’s most useful plants and can save millions of lives! The leaves are the most nutritious part of the plant, being a significant source of B vitamins, vitamin C, provitamin A as beta-carotene, vitamin K, manganesium and protein, among other essential nutrients. Moringa leaves have seven times the Vitamin C of oranges, four times the calcium of milk, four times the vitamin A of carrots, three times the potassium of bananas, and two times the protein of yogurt. It really is a miracle tree! In addition to the rich nutritive value of the leaves, moringa seeds can be used as a quick and simple method for cleaning dirty river water. Studies show that this simple method of filtering not only diminishes water pollution but also harmful bacteria. Powdered moringa seeds adhere to the solids in dirty water and then sink to the bottom, leaving clear, clean water behind. This treatment also removes 90-99% of bacteria. Jiwa Damai retreat center will soon utilize this amazing super food by making moringa seed powder from the trees growing in our organic garden. Moringa powder can be used for cooking or simply sprinkled on top of a salad for an extra dose of health. It won’t be long before our guests and volunteers will be able to feel for themselves all the great benefits of the moringa tree. Let’s see how it works!